Race 1 GTM - De website van onroad-electro! 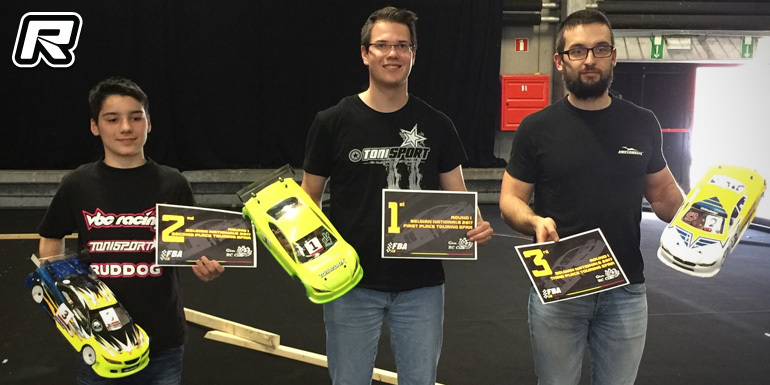 The opening round of the Belgian Electric On-road Nationals was held at the GTM indoor track in Vosselaar. The race was highly anticipated and every driver was eager to show his best for the sole carpet race of the season. Over the winter, the pecking order had been a bit reshuffled. The new rules stipulated that the 17.5 Touring class would be primarily for beginners and this meant that most of the top runners in this class entered in the new 13.5 Stock class, which is being run according to ETS rules. On the other hand, Rico Claeys, the 2016 Stock champion, entered the Modified Touring class. With the absence of multiple Belgian Modified and Formula champion Oliver Buyltinck, and Formula front runner Steve Deblaere, everyone expected some new faces on top of the rostrum. For the Touring Modified class is gaining more and more popularity and so 13 drivers entered this fastest and most challenging class. The class was run according to ETS rules, with each driver having the possibility to use up to two sets of tyres. The category attracted some swift drivers such as young Mitchell Van, but also the likes of former champion Steve Lambrechts, Rico Claeys and Géry Ledocq. Qualifying was all about Mitchell Van Es. The young dutch driver took his first victory in 2015 and was eager to repeat his win. Fellow Awesomatix driver Nicolas Delisé took a fine 2nd position on the grid, some 4 seconds back. Athan De Witte, the youngest Belgian champion in the history of the sport, took a great P3 with his VBC. The top spots were completed by Rico Claeys (Xray) and Steve Lambrechts (Xray). The start of A1 was very exciting. During the first 6 laps, Mitchell increased his lead on Nicolas. From lap 7 onwards, Nicolas started to claw his way back to Mitchells back and followed him closely. Unfortunately, a contact with a backmarker resulted in a body tuck on Mitchell’s car and he dropped out of the race. Nicolas took P1 and was followed by Athan. Athan rolled his car on lap 2, but clawed his way back to the top with some very consistent driving. Rico Claeys headed the Xray challenge and was followed by the orange cars of Steve and Robby Engelen. Eager to set things straight, Mitchell shot off in A2 and never looked back. He took a convincing victory in front of young Athan. Despite having the 2nd fastest car, Nicolas couldn’t capitalize as he had a problem in lap 13 which cost him 5 seconds. Rico took P4 in front of the Xray of Thomas Stockman. Thomas skipped practice on Saturday and was gradually getting faster and faster. A3 would be decisive for the overall victory and podium spots. Mitchell was once again dominating the race while the battle for 2nd was decided in Athan’s favor. He headed Nicolas, Steve and Thomas in A3. 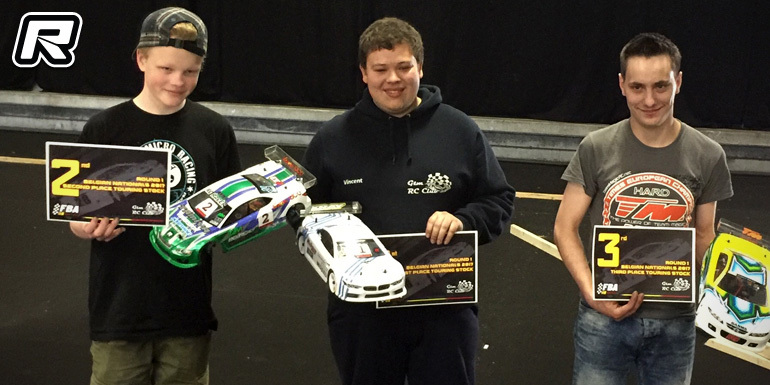 The overall victory thus went to Mitchell Van Ess (Awesomatix), followed by Athan De Witte (VBC) who took his first and deserved podium spot in the Modified class. Third went to Nicolas Delise (Awesomatix), in front of the X-rays of Rico Claeys and Steve Lambrechts. In the Touring Stock class and after qualifying, it was clear that the strongest driver of the field was Vincent Van Gansen. He put his Xray on pole some 4 seconds in front of Florian Joos’ Tamiya who was a further 4 seconds in front of Stefan Rommens’ Team Magic. Pasquinel Neys put his Team Magic in 4th, just in front of Christophe Charlier’s Awesomatix. For A1, Florian Joos tried a different motor and was able to stay close to Vincent, who drove a masterful race. During the first 18 laps, both Florian and Vincent exchanged the fastest lap times. While trying to pass a backmarker, Florian got hit and this ended his challenge as Vincent eased to victory. Stefan Rommens took third in front of Pasquinel and the ARC of Tokke Adams. In A2, Stefan Rommens took a fine start and challenged Florian for P2. They fought hard for the first four corners, and their mutual respect made it nice to watch. In the meantime, Vincent didn’t look back and started to increase his lead while Stefan’s pursuit ended on lap 13 when he rolled his car. Tokke took a fine 4th in front of Christophe Charlier. As he already took the win, which was actually his maiden victory at the Belgian Nationals, Vincent decided to sit out the final leg, letting Florian and Stefan decide who would take P2. Florian started well, but Stefan was hard on his tail, scoring his fastest lap time in lap 2. Everyone was expecting a great battle but unfortunately Stefan rolled his car, letting Florian take the win in A3. Stefan took P2 in front of Pasquinel, Christophe and Tokke. 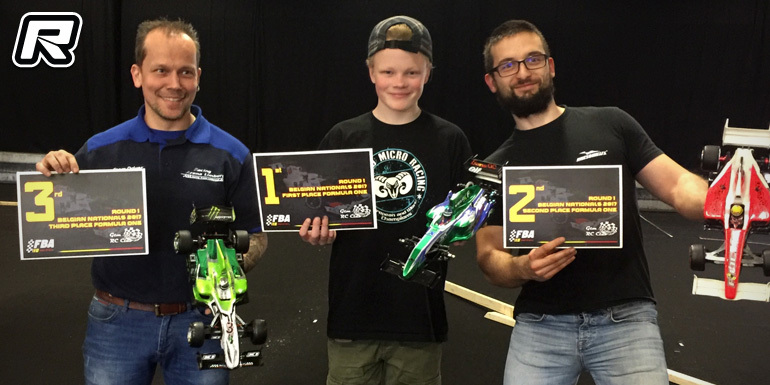 The overall results saw Vincent Van Gansen (Xray), Florian Joos (Tamiya), Stefan Rommens (Team Magic), Paquinel Neys (Team Magic) and Tokke Adams (ARC) make up the top 5. Mandatory for the Formula class are the use of either a Scorpion or Hobbywing power system and Ride tyres, according to the ETS 2016 and 2017 rules. With the absence of both the 2017 Belgian champion Olivier and runner-up Steve, everyone prepared their car for the best to get the coveted first win. Florian Joos (Shepherd) took Q1 with ease. In Q2, Bjorn Frederickx proved to be the surprise of the day as he put his Xray in 2nd, only a second adrift of Florian. In Q3, Florian upped his pace and took pole, 5 seconds in front of Nicolas Delisé’s Roche, who just pipped Bjorn for 2nd. 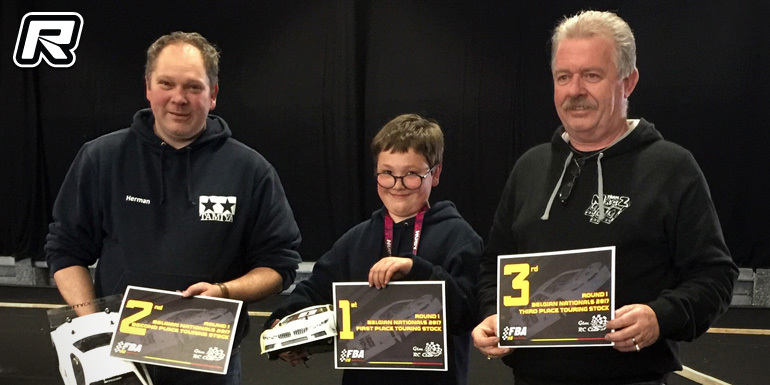 A1 proved to be a bit more exciting as Nicolas was able to keep up with Florian, but Florian kept his cool and took the win in front of Nicolas, Bjorn and the Tamiya of Karl Van Camp and the Xray of Frans Engelen. For A2, Florian tried a stiffer side spring and this transformed his car. He took the holeshot and took a convincing win by recording the only 18 lapper of the weekend and a sub-18 second laptime. Nicolas was very unfortunate to get hit at the start and lost the side link of his Roche. This promoted Bjorn to P2 while Karl Van Camp took a nice P3 in front of the Xrays of Frans Engelen and Yannick Rommens. As Florian decided to sit out A3, the fight for the top podium spot would be decided between Nicolas and Bjorn. Bjorn tried a different tyre prep, but it didn’t work out and so Nicolas took a comfortable win and the overall P2 in front of Bjorn, Frans and Karl. The top five saw Florian Joos (Shepherd) from Nicolas Delisé (Roche), Bjorn Frederickx (Xray), Karl Van Camp (Tamiya) and Frans Engelen (Xray). Rookie class is now primarily for the beginner and to race for fun. Young Alexander Van Gansen took the overall victory in front of his father Herman Van Gansen and Rony Claeys.